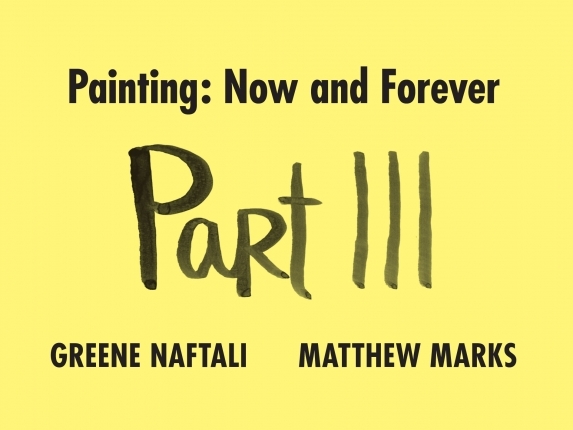 Greene Naftali Gallery and Matthew Marks Gallery are pleased to announce the forthcoming exhibition, Painting: Now and Forever, Part III. This spirited survey, installed across the galleries’ Chelsea spaces, includes over forty international artists working in a wide array of styles who together prove the vitality of contemporary painting. The first Painting: Now and Forever exhibition was organized by Pat Hearn and Matthew Marks in 1998, and the second by Carol Greene and Matthew Marks in 2008. The artists in this exhibition are Gang Zhao, Magnus Andersen, Monika Baer, Robert Bechtle, Nayland Blake, Julien Ceccaldi, Vija Celmins, Xinyi Cheng, Leidy Churchman, Whitney Claflin, Ed Clark, Robert Colescott, Matt Connors, Allan D’Arcangelo, Noah Davis, Lois Dodd, Lukas Duwenhögger, Nicole Eisenman, Janiva Ellis, Jana Euler, Genoveva Filipovic, Sam Gilliam, Tony Greene, Rachel Harrison, Luchita Hurtado, Alex Israel, Jasper Johns, Matsumi Kanemitsu, Bhupen Khakhar, Mathieu Malouf, Helen Marten, Lucy McKenzie, Rodney McMillian, Jill Mulleady, Jeanette Mundt, Howardena Pindell, Suellen Rocca, Eiichi Shibata, Gedi Sibony, Avery Singer, Sylvia Sleigh, Anne Speier, Linda Stark, Hervé Télémaque, Karl Wirsum, and Lynette Yiadom-Boakye.